Pastor Jimmy Terry, Sr., was a man of God, a General in the Army of the Lord, a loving husband, father, grandfather, brother, friend and encourager who was raised by his beloved, “Aunt Lucy” in Tuscaloosa ,Alabama. She always told him two things. I) “Son, if you stick with Jesus, you can make it and 2) Son, when you get married and you and your wife work together, you can have something. 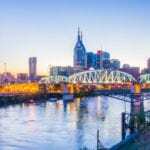 “Standing in his 6 foot 3 inch frame, Pastor Terry loved the Lord, his family and Clarksville , Tennessee. He was called home to rest by his heavenly father on June 21, 2017. He was born during a time of extreme racial divide in the country, yet he was encouraged by his faith to rise above racism and became one of the most admired and beloved ministers by all races throughout the city of Clarksville and beyond. Pastor Terry served in the United States Navy on the USS Saratoga. After his discharge, he returned to his hometown of Dayton, Ohio where he was employed by the city for 13 years. He was encouraged to go to school and enter the ministry. One of his well-known quotes is: “Some are called and some just went, this is my calling.” After graduating from American Baptist College in Nashville, he was selected pastor of the Harvest Grove Baptist Church in Dayton. In 1979, he came to Clarksville as pastor of Mt. Olive Missionary Baptist Church. Three years later in 1982, he founded Tabernacle Missionary Baptist Church along with the four members of his family and 29 other charter members. In 1999, the church opened the Tabernacle Christian School, PreK-3, PreK-4 through fifth grade. The school has since been accredited and continues to this day. This man of God is renowned for uniting all facets of the community. He became deeply involved in civic projects. He worked with others to petition the state to name U.S. Highway 79 “Wilma Rudolph Boulevard, “helped to establish a committee that commissioned a statue to be made in her honor. Since 1980, he was instrumental in making sure there was an organized opening and closing ceremony for Black History Month, as well as, being a Lifetime member of the NAACP. He was one of the first African-Americans to graduate from the first Leadership Clarksville Class 1987, one of the twelve original directors of Legend Bank and also served as Director Emeritus. He was Chaplain of Trustees of the Baptist Memorial Hospital in Memphis, TN that has affiliates in Arkansas and Mississippi and served on the Clarksville Chamber of Commerce Board of Directors. He was a member of South Eastern African American Publishers Association (NNPA). Pastor Terry was involved in the United Way Campaign Fundraising, supported the Austin Peay Candlelight Ball, the Custom House Museum’s Flying High yearly fundraisers and was chairperson for the $1 million fundraiser of American Baptist College. He was honored to give the invocation prayer at Gov. Ned McWherter’s 1987 inauguration and on several occasions performed the opening prayer for the Governor’s Prayer Breakfast in Nashville. As a member of Clarksville Ministerial Association, where he was chairman for two years, he dedicated his time to ensuring the association was visible in the community and instrumental in the Unity Day Celebrations on Dr. Martin Luther King, Jr’s Day, the Elected Official ‘s Breakfast, National Prayer Day and the Bible Reading Marathon. In 2007, after noting that CHRIST was being removed from the true meaning of Christmas and Easter, he took up the mantle to rectify this egregious error by purchasing yard signs that made it clear that Christmas and Easter is All About JESUS. 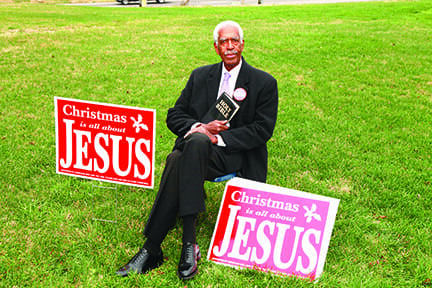 The Jesus Sign Ministry has been placed in yards in Clarksville, Montgomery County and all 95 counties in Tennessee. This ministry has exceeded far beyond his vision and has now gone nationwide. Tabernacle is also known for the Yearly Scriptures Pastor Terry has designed since 2010. Until we meet on the other shore, Pastor Terry‘s spirit, hugs and encouragement will surely be missed by his family, friends and the Clarksville community. He is survived by his wife of 43 years, Servella Broomfield Terry of Clarksville, two daughters, Loretta Zachary and and Shana Madry of Ohio, two sons, Vaughn Terry of Illinois and Jimmy Terry, Jr., of Clarksville, 10 grandchildren and 6 great-grandchildren, a host of friends, colleagues and business associates. Next articleAre You Biting Off More Than You Can Chew?